I noticed that many of the 2012 predictions for SEO agreed that Google+ would be important. 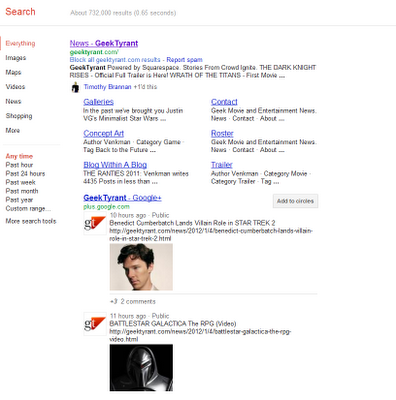 We also know that Google+ Pages for businesses and brands have started to appear in the search results pages. This, however, is a new (for me) way to incorporate Google+ content in the web results and it utterly dominates the SERPs. Look at just how much of the screen those images take up. Clicks take you to the Google+ page and not the URL you can clearly see associated with the post. Geek Tyrant is also an especially interesting Google+ Page for Brands as with just over 500 followers it is one of the smallest I know that has qualified for Google Direct. To get this result I searched for [geektyrant].